Protestant numbers in France fell from ten per cent of the population in 1598, when Henri IV gave protection by the Edict of Nantes, to a persecuted two per cent in 1700 following its revocation in 1685 by Louis XIV. The destruction of Protestantism in France succeeded best in the cities where Huguenots were vulnerable and could only remain faithful to their beliefs in secret; but in the mountains of the Cévennes in Languedoc there were hidden sites for unlawful religious assemblies, isolated villages and farms, and a people of Celtic origin passionately devoted to their form of Christianity with leanings to mysticism and trance-induced biblical prophecy. The persecution-torture, execution, confiscation of children, imposition of ruinous fines—and the violent hostility of the Catholic clergy combined to create conditions of terror and misery in the Cévennes that would one day end in explosion. When it came, the court and civil servants with unlimited power but mediocre intelligence were taken by surprise. No one conceived that the Camisards, bands of shepherds, farm labourers and wool combers chanting psalms as they went ill-armed into battle and led by daring men without education or status, could successfully ambush and sometimes destroy well-armed troops of the crown—but they did so. 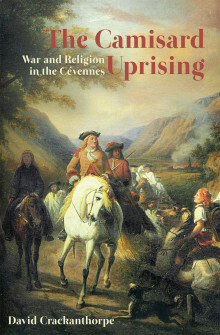 David Crackanthorpe reveals how the uprising raged from 1702 to 1704 with atrocities on both sides, a huge increase in military numbers, and the burning of hundreds of villages in the Cévennes. Inevitably, Camisard force was finally broken and by a rare act of intelligence an amnesty allowed survivors to leave the country. French Protestantism and the Camisard memory survived in the traditions of a world-wide Huguenot diaspora, while at the Revolution, which finally brought religious toleration, many French families that had nominally abjured their faith safely returned to it and have continued to play an important part in French life and history. DAVID CRACKANTHORPE lived for thirty-five years in the foothills of the Cévennes or in Nîmes where he wrote his novel Stolen Marches about resistance in the region during the Second World War.